When I was redecorating my daughters’ rooms I definitely had some serious thinking to do before I picked new kids bedroom furniture. Luckily, I asked myself these 5 questions, picked the right kids furniture and both my girls are thrilled with their rooms. Phew…that’s a relief! Go ahead and ask yourself these questions and soon your kids will have rooms they’ll rave about too! They won’t rave because you got the most expensive kids furniture or the most stylish, they’ll be thrilled because you got the right kids bedroom furniture for them! That’s all that matters. Here are the 5 questions and follow-up questions you can ask to make sure you get the answers you need to create the best kids bedroom possible! Good luck with your kids bedroom design efforts!!! #1: Does your child like the kids bedroom furniture set? To make sure you get the full scoop about your kid’s likes ask about these topics. What are your child’s favorite furniture colors? Which style bedroom furniture does your kid appreciate: modern, traditional, funky, eclectic etc… What type of a vibe does your kid want in the room: calming, fun, stylish? That should do it for that question. #2: Is the furniture you and your child like the right size? You know your kid’s height and height potential. Find out if he wants lots of sleeping space which would mean a double/full/queen bed would be best, or would your kid rather have more floor space that a twin size bed would provide. Would a big bean bag chair that your child can use forever be a good choice, or would he prefer a kid-size seat to start? Does your kid have tons of clothes and accessories which would mean a greater need for storage, or is he a minimalist and just one dresser will do? 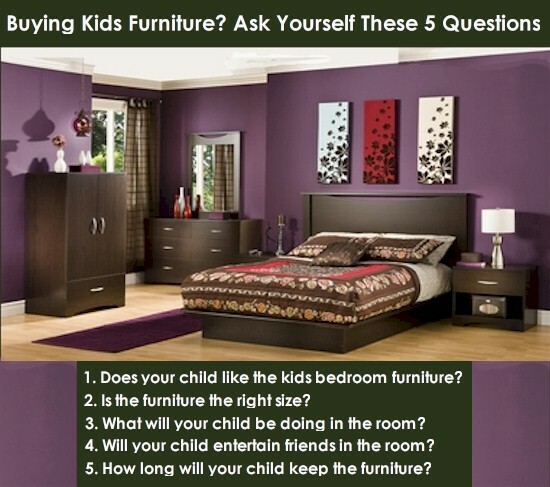 Those Q&A will give you an insight into the size of furniture your kid wants/needs! #3: What activities will your child want to do in the bedroom? Does your child like the idea of having a private study or reading space? Will he want a private place to listen to his favorite tunes on his ipod or stereo? Will your kid spend a few hours playing video games in the room and need a media center to do that? What’s gonna take place in the room and what furniture do you need to make that happen? Having answers to these questions will ensure you create a kids bedroom that inspires your child to do his most important and favorite activities. #4: Will your child be hanging out with friends in the room? Is your kid an introvert or extravert? Will he have just his very best friend over to hang out in the room or have several buds over to chill out after school or the big game? This will show you how many chairs you need to add to the space and if you need a pull out or bunk bed for sleepovers. #5: How long will your child want to keep the kids bedroom furniture? Is your child typically wishy-washy and will want a room redesign in a few years, or is he the more stable type that likes things to stay the same? Is your kid into new fads every year or does he keep the same interests most of the time? This can help you decide on price and number of kids bedroom furniture items to buy. Once you’ve exhausted these 5 questions and written down the answers you’ll have a clear vision of all the key points you need to know to get the right kids bedroom furniture. You’ll know the types of kids furniture your child needs, style and color preferred and price range to spend and then all you’ll need to do is shop! Kids can’t chill out if they don’t have somewhere to sit and relax. It’s up to parents to find the right kids chairs for the job! Believe it or not this takes careful planning because you have to first know your kid’s schedule and habits. I know my girls LOVE to play the Wii, yet I really don’t want them doing it for more than an hour or so per day, so instead of giving them gaming chairs I let them pull out some very uncomfortable folding chairs, so after about an hour their behinds are a little sore and their desire to play Wii is over. On the other hand if you, personally, are into playing the Wii and that’s how you spend family time with your kids then I’d recommend getting a few cozy seats like the Blue MOD Lounger by Offi, so you can spend some quality family time together and stay comfy the entire time. These seats also look really unique in a space and will spruce up any room decor! Now, since my home is made up of mostly girls (besides my hubby) then you know there’s a lot of talking going on. Since we’re a gabby family I’ve set-up a comfy seating area in our playroom where me and the girls can go and hang out for a while. The perfect chairs for this type of space are the Comfort Research Bean Bag Chairs. I’d recommend getting a two-seater for mom and dad to share and then one single-seater for each child and you’ll be amazed at how much more quality time your family will spend together when there’s a place designed just for that. Another very important kid seat is the homework chair. If kids don’t have a study space their school work just doesn’t get done, or done well. That’s where a comfy desk chair comes into play, or if you don’t have an actual desk why not get a chair like the Rock-a-Buddies Schoolhouse Rocker that comes with an attached pencil box, plus Flip up Hinged Desk, Abacus and even a music box that plays the ABC song. It’s also a fun rocker, so when homework time is over your child is sure to stick around and rock a while to relax after a long day. My girls love to read, but it took me several trips to the library to finally find some books that interested them. They also struggled with figuring out a good place for quiet reading time until I added a reading seat to their bedrooms. The perfect type of reading seat is one like the Rock-a-My-Baby Bench Seat with Storage. You can put this seat against the wall or under a window and it’s comfy up top and has plenty of storage for books below. 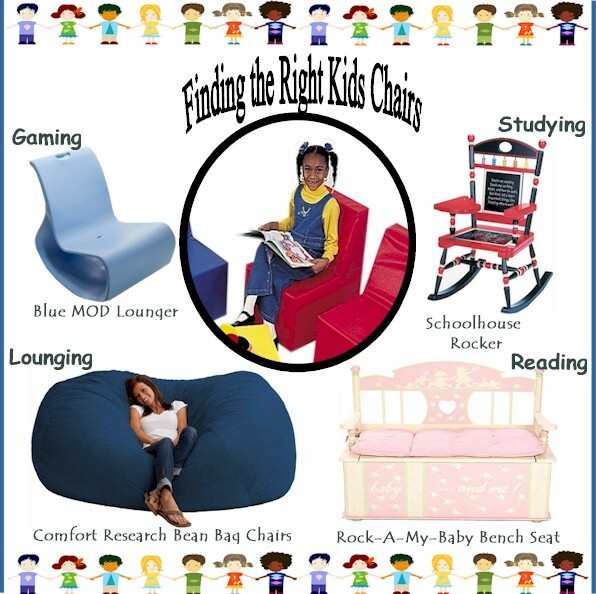 Companies like Levels of Discovery, Comfort Research and Offi, plus many others have amazing kids chairs to satisfy every kid need. To see more visit us today at SimplyKidsFurniture.com. Summer is here and in many areas it’s already reaching hot, hot temperatures. It’s at this time of year you see tons of families outside having fun, but there’s a risk. With sunny days there’s a chance to get sun burns, so it’s important to take precautions to keep your kids’ skin protected. 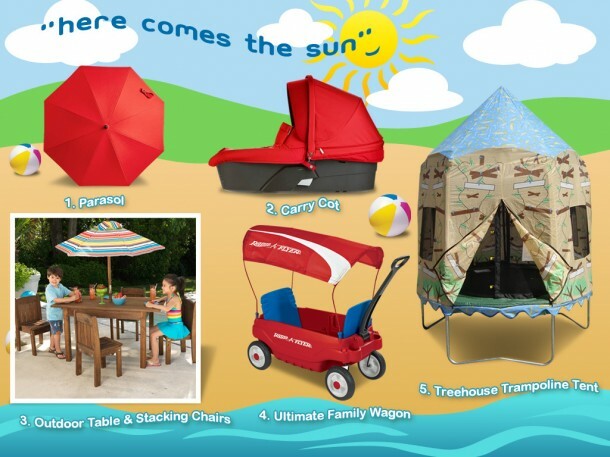 We have just the right baby and kid products to keep kids in the shade on those sunny days. Below you’ll see our Summer Inspiration Board that combines everything needed to keep kids protected from the sun’s UV rays when on family walks, playing in the yard, heading to the beach and more. To see all of our baby and kid items please visit us at SimplyKidsFurniture.com. If you like any of the items on our inspiration board you can learn more about those products by clicking on the name of that product below. On Tuesday, May 8, 2012 the world lost a wonderful author, Maurice Sendak, who wrote the truth about childhood anxiety, fears and crazy emotions in his famous book, Where the Wild Things Are. I remember reading this book to my daughter over and over again and she couldn’t get enough of it! This book is so popular that even President Obama read it out loud at the 2009 Easter Egg Roll. Sendak had a way of really showing how interesting kids can be and how wild a child’s imagination can get. The graphics in his famous book bring the words to life and in honor of this author’s incredible talent we’ve put together a Where the Wild Things Inspiration Board to show you how you can create a kid’s bedroom that’s as magical as Maurice Sendak’s book! Want to create a truly unique room for your daughter? You’re in luck. Below you’ll learn about three unique bed and nightstand combos that will blow you away with their “cool factor!” These are girl’s bedroom furniture sets that can start in a young child’s bedroom, but continue to be enjoyed by a teenage diva or college grad. Don’t just take my word for it. See for yourself why these three kids bedroom furniture combos are a smart choice for any girl’s bedroom. If you like what you see and want to see even more of our kids bedroom furniture selections visit us at SimplyKidsFurniture today! First on this list of fabulous furniture combos is the Alligator Scallop Collection with Daybed and End Table. What I love most about this set is of course the unique, scalloped edges of each piece. I also adore the fact that this furniture combo comes in some soft and beautiful color choices including: White, Butter and Sage Green. What’s also spectacular is the fact that the day bed has a pop-up trundle that you can pull out of hiding when a guest sleeps over. Place the end table next to the darling daybed and your daughter will absolutely love her special room. 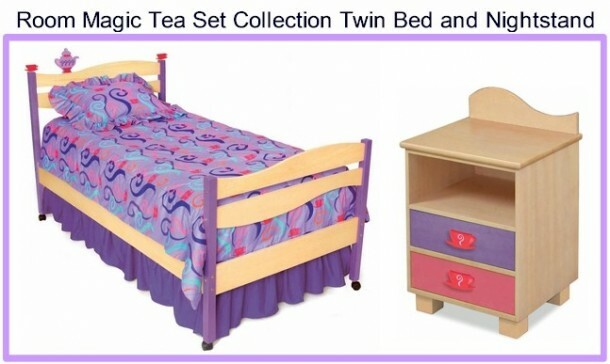 Our second special girl’s bedroom furniture combo is the Room Magic Little Girls Tea Set Collection with Twin Bed and Nightstand. These two bedroom furniture pieces are quite special, with the mix of solid birch and purple and pink paint. The twin bed is so darling, with uniquely curving head and footboard, purple posts and cute tea pot with tea cups on the headboard. The matching nightstand has tea cups as drawer pulls and purple and pink drawer fronts against a beautiful birch frame. As your daughter goes from little princess to teenage diva this set can blossom with her. The nightstand drawers are double sided, so you can turn them around to have a solid birch night table. You can also purchase more sophisticated bedding to make the “once adorable” kids bed into a chic “teenager’s” bed. This is a kids bedroom furniture set that will definitely be talked about over tea. 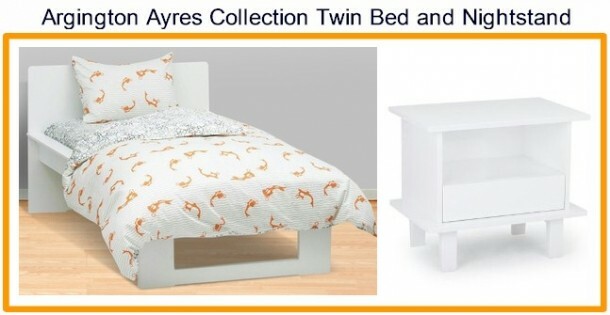 The last gorgeous and unique girl’s bedroom furniture set on this short list is the Argington Ayres Collection with Twin Bed and Nightstand. The modern, sleek design of both furnishings makes this furniture combo quite special. This set is available in three stunning finishes including: Birch, White and Espresso. The boxy looking shape of each piece will create a very contemporary looking girl’s bedroom. This is a set that a teen will love as much as a toddler, so it can remain in your daughter’s room till she takes the set with her to college.